Life-size effigies of the saint are distributed throughout the highlands. He sits among gifts of flowers, bread, alcohol, and smoke. He hears pleas for wealth, safety, and luck, and is adored, feared, and hated. He is San Simón, Maximón, Rilaj Mam, Judas, El Tata. A caudillo, cultural ancestor, soldier, and folk saint, San Simón is revered throughout the highlands of Guatemala by the contemporary Maya, a symbol of their past and present ethnic identity. Life-size effigies of the saint are distributed throughout the highlands. They are cared for in community shrines by local confraternities, much to the chagrin of the Catholic and Protestant Church. Shown here is the San Simón of the town of Zunil, in the Department of Quetzaltenango. San Simón effigies typically have light skin and a well-manicured mustache or goatee. Effigies are displayed seated and often hold a vara, or staff, both of which are symbols of his status as an authority figure. He wears a suit and tie along with his trademark cowboy hat and boots. San Simón often wears locally produced textiles, such as the faja, or woven sash, sported by this effigy in Zunil. Theories abound as to the saint’s origin and mythology, but his status as an indigenous ancestral figure is key to his identity. The concept of San Simón as an ancestral remnant of the past is similar to other Maya mythological figures that were “left-overs” from another time. Effigies of this kind have deep roots in Mesoamerica, but modern communal devotion to San Simón is also influenced by Catholicism. The Spanish implemented the confraternity system after the conquest to speed conversion and re-organize indigenous communities. 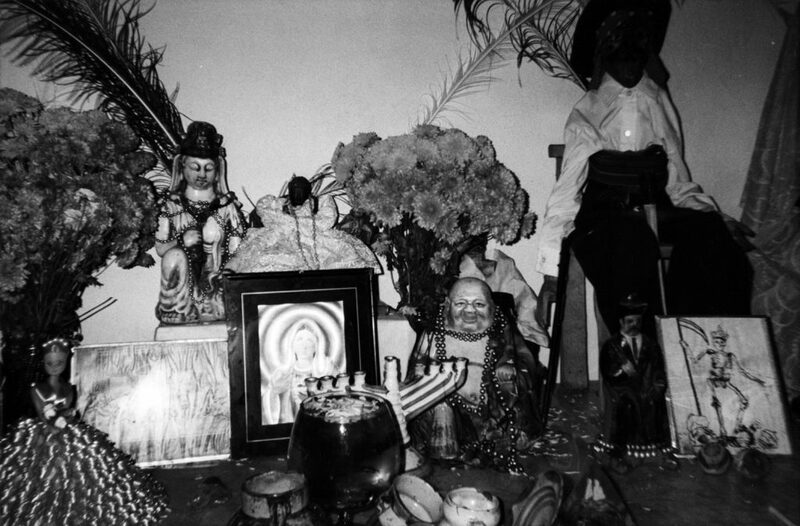 The mixture of the confraternity system of saints with indigenous traditions is an example of syncretism: the Maya appropriation and redefinition of Spanish religion in the face of colonialism, church power, and state repression. Despite his ladino appearance, San Simón belongs wholly to the Maya in a way that the Virgin and San Pedro cannot. His European appearance and dress, however, refracts an even more modern experience of his indigenous followers. 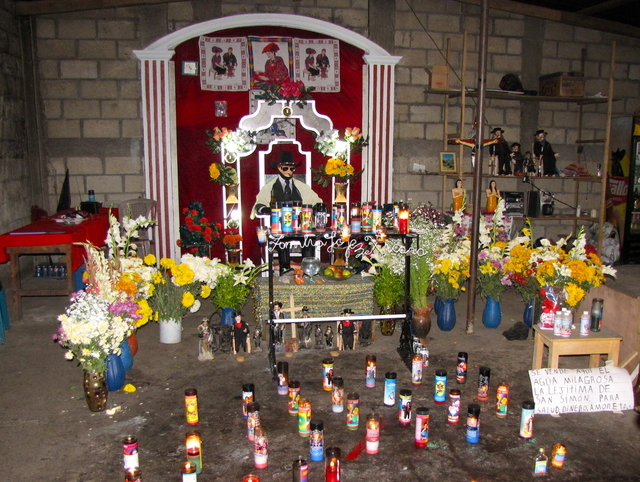 Photographs taken of a community shrine in Sololá in the wake of La Violencia show the saint’s effigy dressed in camouflage fatigues, leather combat boots, and aviator sunglasses. The costume is one from recent history, suggesting that indigenous communities looked to United States and Guatemalan military officials when dressing the saint during the Guatemala Civil War. In this period of relentless terror, Maya desire for control was directed to San Simón, a mimetic representation of the state and its overarching power. 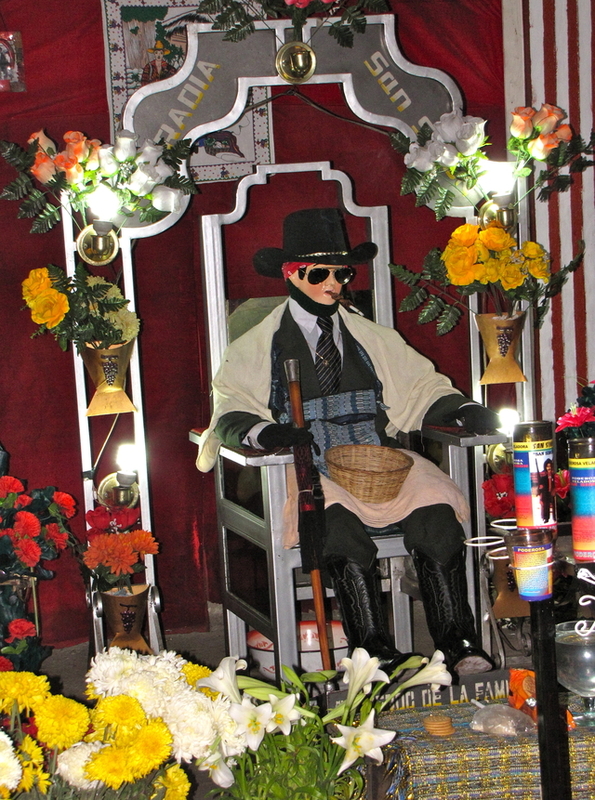 Many San Simón effigies, like that of Zunil, still wear aviator sunglasses, suggesting his continued use as a figure of resistance. Originally published by The Appendix 1:1 (December 2012) under the terms of a Creative Commons Attribution 4.0 International license. This entry was posted in Uncategorized and tagged History, Maximon, Maya, Religion. Bookmark the permalink.